Turkey currently has the dangerous combination of increased reliance on foreign currency-denominated debt and a sharp depreciation of the lira (Figure 1). When assets and income streams are primarily denominated in the local currency (as is typically the case), foreign currency debt implies a currency mismatch. Since then, a wide range of EMEs have grown their local-currency bond markets and rely less on foreign currency debt. For example, in 2001, half of Latin American bonds were denominated in foreign currency; by 2011, three-quarters were local currency bonds. What was the catalyst for this reduction in currency mismatches? One important change was the adoption of inflation-targeting regimes so that inflation rates in EMEs converged toward those of advanced economies (see Figure 2 and Daly and O’Doherty 2018). Ogrokhina and Rodriguez (2018) demonstrated that EMEs that adopted inflation targeting experienced a significant reduction in the foreign currency share of international bonds. 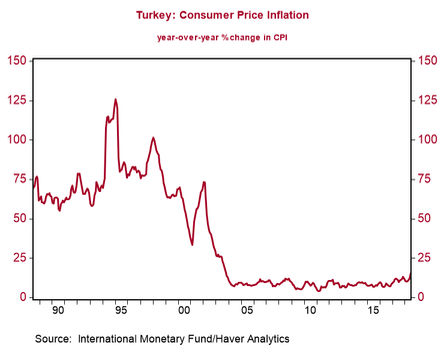 From January 2002 Turkey successfully adopted an inflation-targeting framework that quickly brought its inflation rate down from 70% to below 10%, a level it maintained for more than a decade (Figure 3). Stable inflation helped local bond markets to grow. With flourishing local bond markets, Turkish firms, individuals, and the government did not have to rely on potentially dangerous foreign currency borrowing. The 'original sin' hypothesis about EMEs suggested in its strongest form that, no matter what policies they put in place or institutions they developed, EMEs had an innate condition that inhibited their ability to borrow in local currency. The experience of Turkey and many other EMEs indicates that the inhibitor was just sin, in no way original. Once the necessary conditions were in place – broadly, low inflation, strong institutions, and well-defined creditor rights – local bond markets thrived. 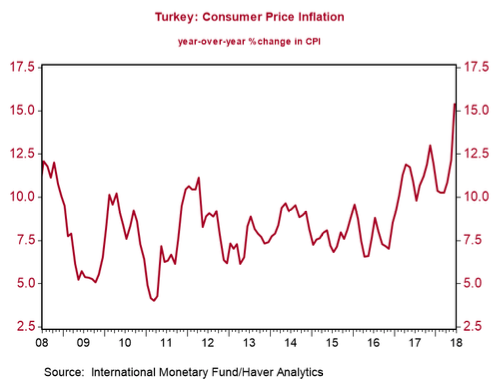 As at September 2018, the environment in Turkey suggests previous hard-fought gains against inflation are slipping away. Inflation has spiked – it was recently reported at 17.9% and accelerating (Figure 4) – as the independence of the central bank (and thus the credibility of the inflation target) has been compromised. Increased inflation has naturally led to increased borrowing costs, making foreign currency borrowing an attractive alternative – but only while the lira remained stable. 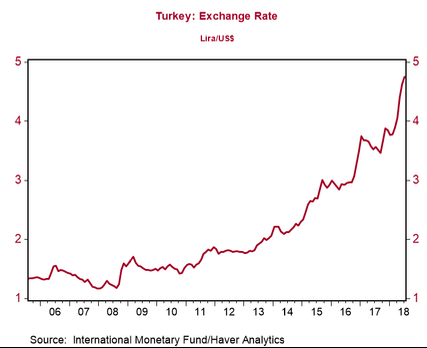 The re-emergence of inflation, alongside the erosion of other creditor-friendly policies, has made it more difficult for Turkey to borrow in lira (especially from abroad), resulting in the surge in foreign currency borrowing depicted in Figure 1. But Turkey is not alone in its recent increased reliance on foreign currency debt. Although EMEs in general are much less financially fragile than they were 20 years ago, progress in reducing the share of foreign currency bonds issued by EMEs has reversed (Figure 5). In particular, Latin American economies such as Colombia and Peru have increased the amount of foreign currency bonds they have issued. Note: The figure, which excludes Turkey, includes 8 EMEs for which data is available from 2001. A more widespread increase in foreign currency borrowing suggests global factors might have come into play. Many studies (e.g. Burger et al. 2015, Chari et al. 2017, Fratzscheret al. 2018) provide evidence that the expansionary policies pursued by the Federal Reserve, ECB, and Bank of Japan have led investors to buy EME bonds in a search for yield. This may have encouraged EME borrowers to issue more foreign currency bonds, as we know that advanced economy savers exhibit home currency bias (Burger et al. 2018, Maggiori et al. 2018, Boermans and Vermeulen 2016), and so prefer bonds denominated in their own currency. 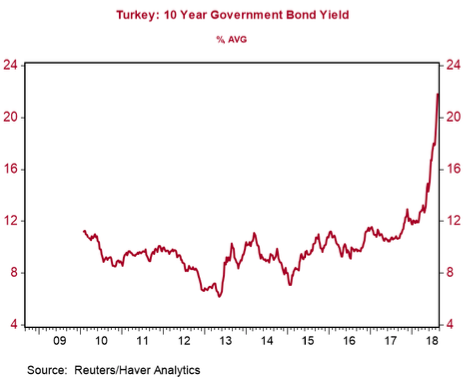 While interest rates were surging in Turkey, low interest rate policies in many advanced economies made it attractive for Turkish entities to borrow in foreign currencies. 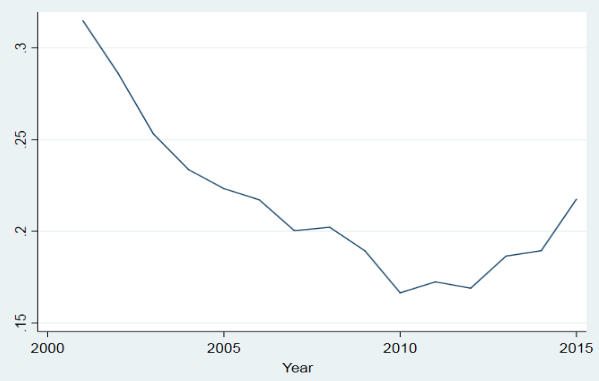 EMEs have enjoyed a remarkably stable decade during which crises have been rare, and have usually been linked to obvious sins (Venezuela, for example). The adoption of inflation-targeting regimes with flexible exchange rates have allowed many EMEs to successfully implement countercyclical policies, contributing to macroeconomic resilience even in the face of large shocks from advanced economies (Vegh and Vuletin 2014, Alvarez and De Gregorio 2014). In particular, there has been progress in eliminating the inflation sin that previously stifled the development of local bond markets. Recently Turkey and others have increased potentially dangerous borrowing in foreign currencies. 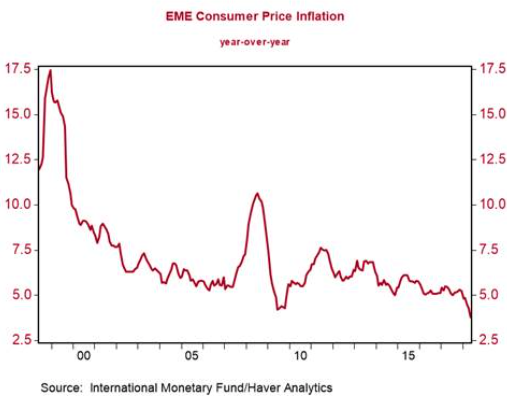 While some of the increase may be induced by advanced economy policies, some is due to home-grown issues, such as increased inflation and the erosion of credit-friendly policies, that EMEs could control. The lessons from the past two decades should not be lost. There is no original sin that precludes EMEs from developing their local currency bond markets. The path away from foreign currency borrowing and the currency mismatches that go with it has been clear for some time now. Many EMEs, Turkey included, have chosen to take it. But Turkey’s current situation is a reminder that recent stability could be reversed if policymakers do not remain vigilant. Back-sliding on inflation targeting at a time of low global interest rates has led to an increase in foreign currency borrowing that could increase the number of defaults in the future. Alvarez, R, and J De Gregorio (2014), "Understanding Differences in Growth Performance in Latin America and Developing Countries between the Asian and the Global Financial Crises", IMF Economic Review 62(4): 494-525. Boermans, M, and R Vermeulen (2016), "Newton meets Van Leeuwenhoek: Identifying international investors’ common currency preferences", Finance Research Letters 17: 62-65. Burger, J, R Sengupta, F Warnock, and V Warnock (2015), "US investment in global bonds: As the Fed pushes, some EMEs pull", Economic Policy 30(84): 729-766. Burger, J, and F Warnock (2006), "Local Currency Bond Markets", IMF Staff Papers 53: 115-132. Burger, J, F Warnock, and V Warnock (2012), "Emerging local currency bond markets", Financial Analysts Journal 68(4): 73-93. Burger, J, F Warnock, and V Warnock (2018), "Currency Matters: Analyzing International Bond Portfolios", Journal of International Economics 114: 376-388. Chari, A, K Stedman, and C Lundblad (2017), "Taper tantrums: QE, its aftermath and emerging market capital Flows", NBER working paper 23474. Claessens, S, D Klingebiel, S Schmukler (2007), "Government bonds in domestic and foreign currency: The role of institutional and macroeconomic factors", Review of International Economics 15(2): 370-413. Daly, K and L O’Doherty (2018), "The convergence in emerging market inflation", VoxEU.org, 5 March. Fratzscher, M, M Lo Duca, and R Straub (2018), "On the international spillovers of US quantitative easing", Economic Journal 128: 330-377. Goldstein, M and P Turner (2004), Controlling Currency Mismatches in Emerging Economies, Institute for International Economics. Maggiori, M, B Neiman, and J Schreger (2018), "International Currencies and Capital Allocation", NBER working paper 24673. Ogrokhina, O, and C Rodriguez (forthcoming), "The Role of Inflation Targeting in International Debt Denomination in Developing Countries", Journal of International Economics. Vegh, C, and G Vuletin (2014), "The Road to Redemption: Policy Response to Crises in Latin America", IMF Economic Review 62(4): 526-568. After the Asian crisis, Goldstein and Turner (2004) emphasized the role of currency mismatches in increasing the likelihood and severity of a financial crisis. Previous VoxEU columnists have sounded alarms for and other EMEs – check the 'See also' box for examples. See Burger and Warnock (2006), Claessens et al. (2007), and Burger et al. (2012) for the effect of inflation and creditor rights on local bond market development.